Promotions are tactical moves changing material balance where a pawn reaches its promotion square on the eighth (or first) rank to transform to a piece of the players choice, either a queen, knight, rook or bishop of the same color. The pawn may reach the eighth rank due to a pawn push or capture. 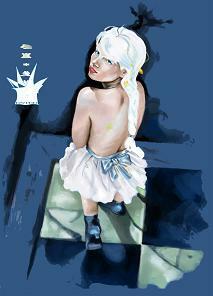 A pawn promoting to a queen while capturing the opponent queen defines the maximum amount of material a move may gain. Since theoretical each pawn may promote, the number of pawns, eight, per side defines the maximum number of pieces, that is one side may have up to nine queens, or ten knights, as well as bishops or rooks. The maximum sum of these pieces, seven of the initial position, is fifteen. Most often in practical play promotions occur to the strongest piece, the queen, also referred as queening. A promotion to other than the queen is called minor- or underpromotion, where once in a while the promotion to a knight has some practical relevance due to its distinct attacking with the possibility to check  or to fork, see for instance what happened at ACM 1991#KnightPromotion in Albuquerque to Lachex . Minor promotions to rook and bishop, whose attacks are sub-set of the queen are very rarely about to avoid stalemate - or may occur at the root in cases the promoted piece may be captured immediately anyway. In move encoding the promoted piece requires two extra bits. In move generation it is quite common while producing the queen promotion, also to generate all the additional minor promotions, that is to write four moves to a move list with all two-bit combinations indicating the promoted piece, instead of one. However, some programs only generate queening and use unmake move of a queen promotion as trigger to conditionally generate further minor promotions, assuming the queen promotion didn't fail high or its refutation was not an immediate capture. Bishop and rook promotions may only generated if the queen promotion returns an explicit stalemate score. Other programs even omit minor promotions or at least underpromotions to rook and bishop inside their search except the root at all, with the motivation the reduced code and branching factor likely pays off in practical playing strength. In quiescence search most programs only consider queening. Entering moves by a human operator within a graphical user interface requires modal interaction, for instance dragging the piece with a mouse from the departure square to a destination square. In case of promotions a modal dialog or pop-up menu is necessary to choose the promoted piece to finally terminate the modal move entering interaction. This page was last edited on 20 October 2018, at 08:19.